I’ve talked before here about my feelings on being present with my family and friends and how, as with the majority of us, I often find myself sucked into social media, my phone, and just technology in general when I should be more actively engaging with loved ones. It’s a problem I think most of have, and although it’s an incredibly easy one to solve, we have to make a conscious effort to do it. 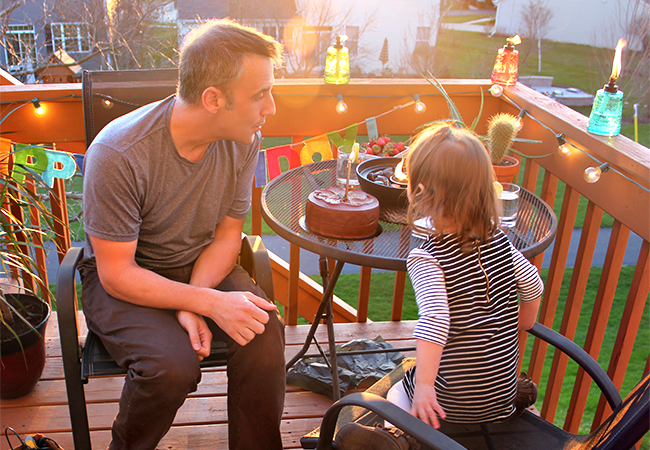 So last month I decided that my little family was going to take an evening to have a belated birthday celebration for my husband that involved spending time outside (the weather was just finally starting to warm up) and powering down our cellphones, iPads, and television. 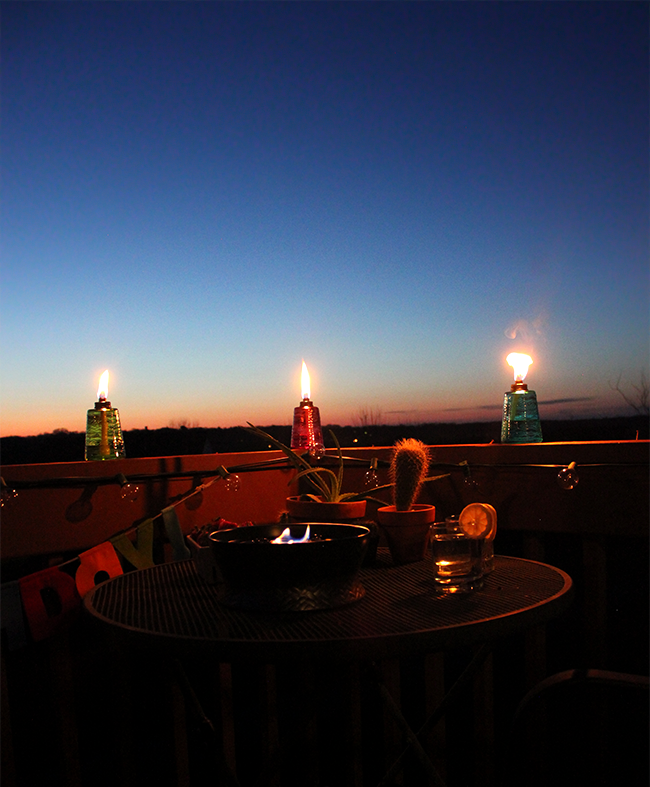 It would just be the four of us hanging out in an intimate setting on our back deck, enjoying one another’s company. My biggest goal (aside from turning off all devices!) 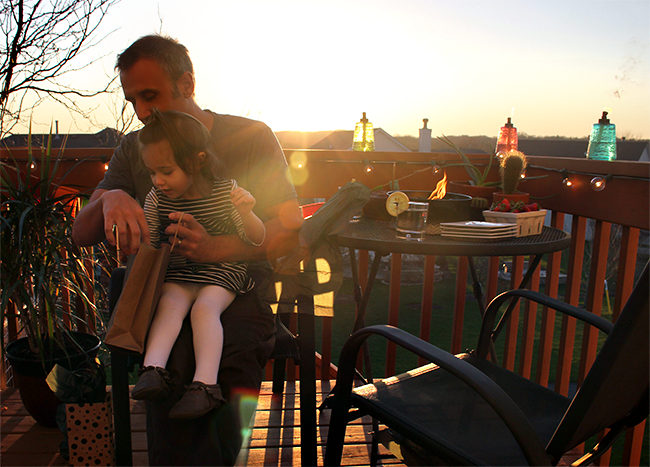 for our casual early evening hangout session was to decorate our deck in a way that would create a warm, comfortable, inviting aesthetic, so we’d just naturally feel present and engaged as a family. I wanted to keep things simple, but fun and colorful as well. 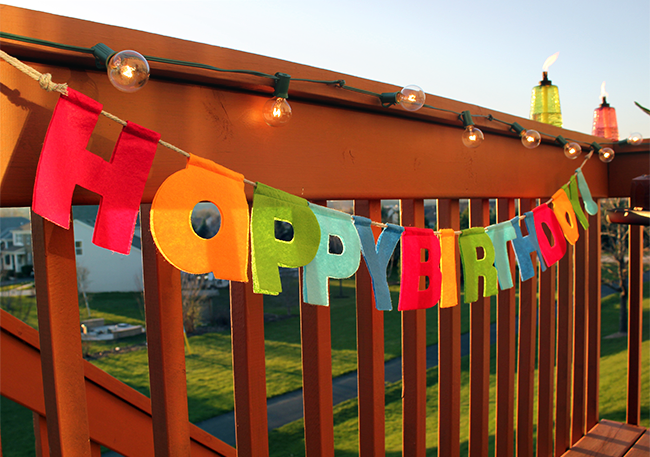 I started by hanging a vibrant felt “Happy Birthday” banner to set the theme. I bought a pretty yellow daisy plant and arranged that on a smaller table, then (finally!) 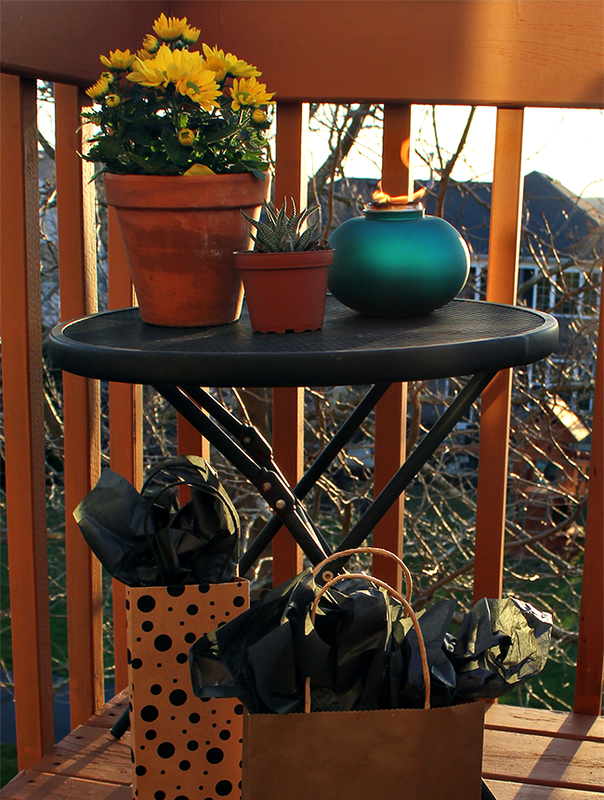 brought some indoor plants outside for the season. The final step was to (literally) add a warm glow to the space with some of my favorite items from TIKI Brand’s new Clean Burn tabletop product line. 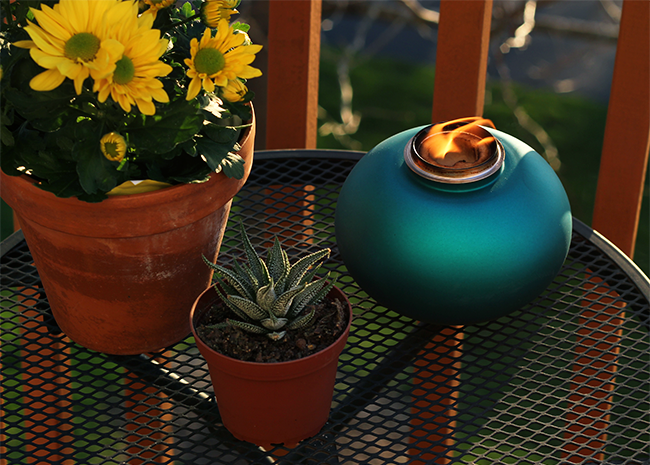 I put out a pretty teal colored small Clean Burn Tabletop Firepiece, and for the the focal piece of our family celebration’s decor, I set out our large TIKI Brand Clean tabletop firepiece. 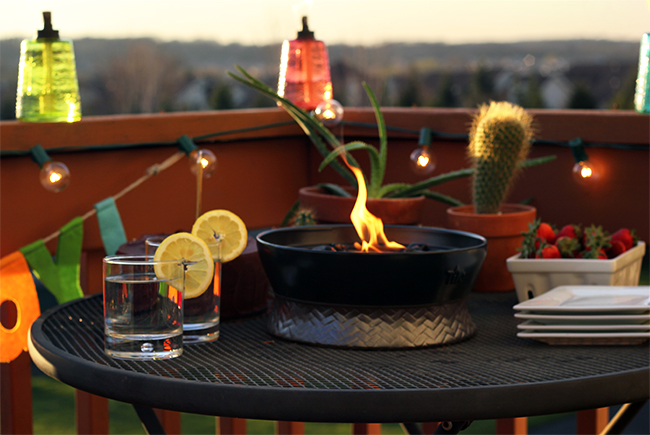 We love this piece so much because it’s like our own little backyard fire pit that fits perfectly on our deck table. 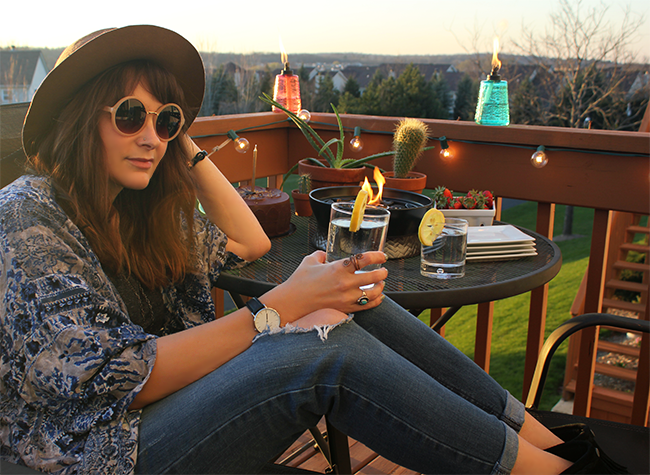 The flame is rich and bright and provides light and ambiance, and along with all of our other other TIKI Brand pieces, created such a wonderful vibe for our mini party. 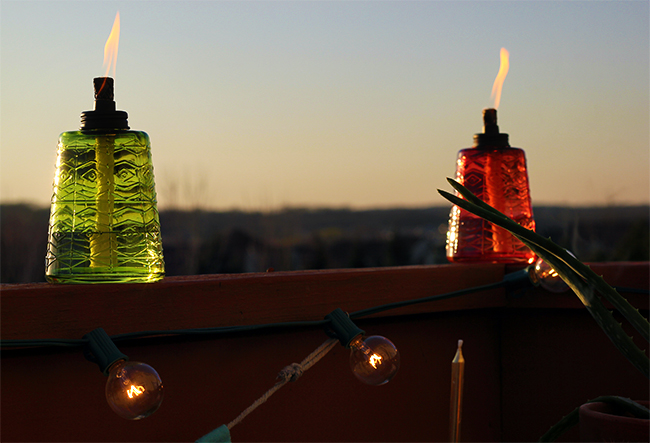 I also set out three of their Glass Table Torches for pops of color. 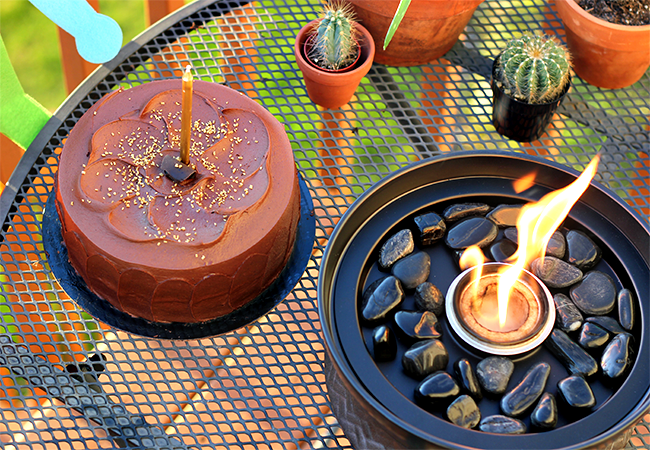 These TIKI Brand tabletop fireplaces are so cool you guys. One of my favorite parts is the Clean Burn Torch Fuel they use. 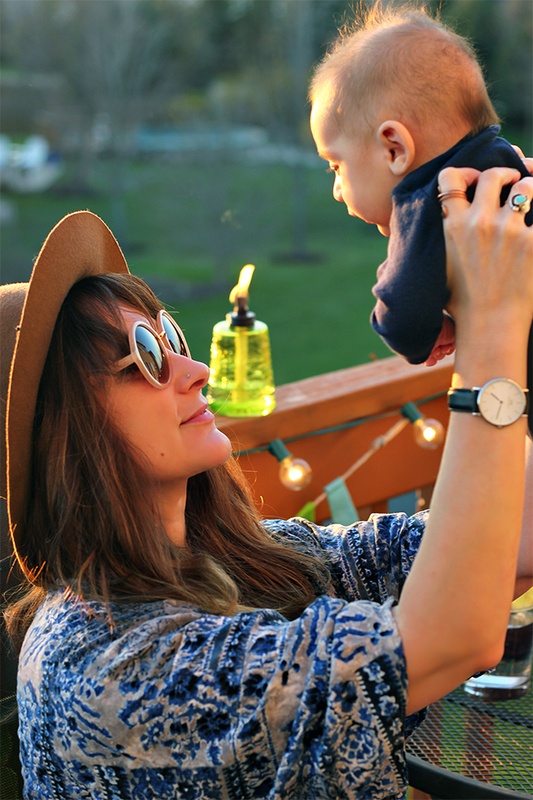 It creates a gorgeous bright flame, and one bottle provides a whole 24 hours of burn time. And best of all, the formula is totally plant-based (!!!) 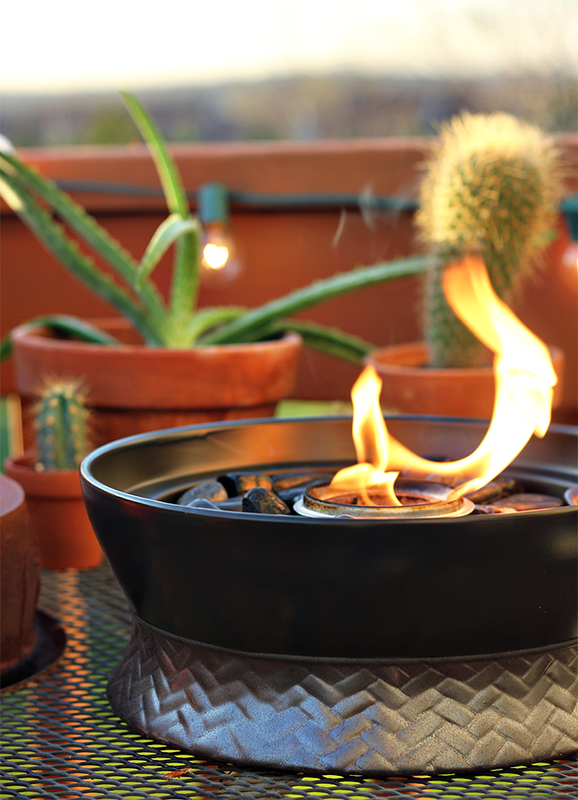 with no petroleum-based ingredients – so the burn is clean, without excess smoke or unpleasant petroleum odors. And I love the that Firepieces themselves use reusable Roundwick burner-systems that provide up to three hours of burn time with every fill (and also reduce risk of fuel spillage). 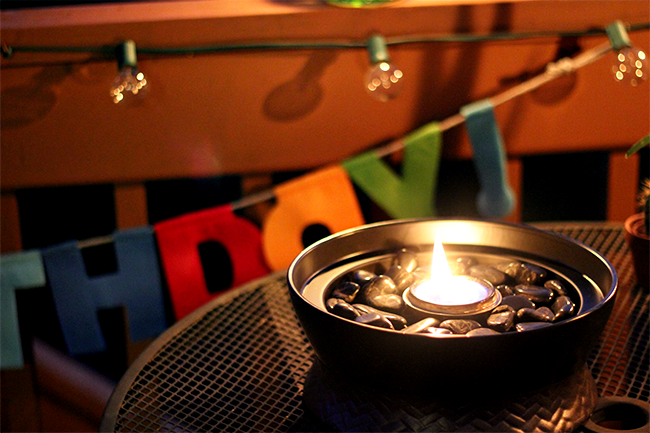 They’re so quick and easy to set up, and once they’re lit, they’re good to go for the evening. 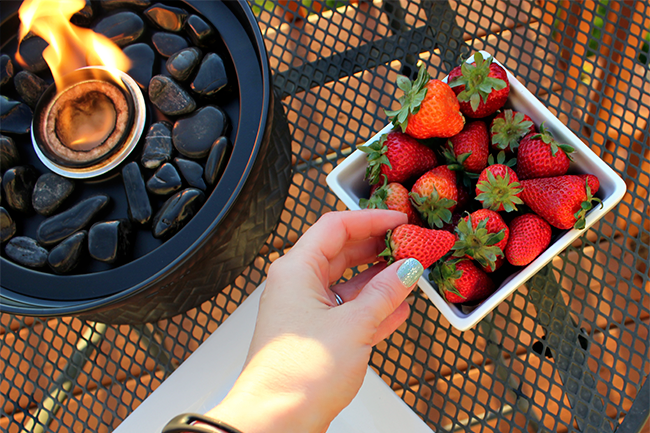 We had such a great time at our first outdoor family evening together of the season, watching my husband open gifts (or, in truth, watching my daughter open them for him), eating chocolate birthday cake and strawberries, talking, engaging, laughing, and connecting with one another. By completely turning off our phones and electronics and replacing that cold blue light at which we’re so used to staring with the warm glow of our Tabletop Firepieces, it was easy to be completely present and let everything else fade into the background as we just relaxed and savored the experience. My husband said it was actually the best birthday party he’d ever had (a relief since it was so easy compared to some of the more elaborate, stressful birthday parties I’d planned for him in the past). 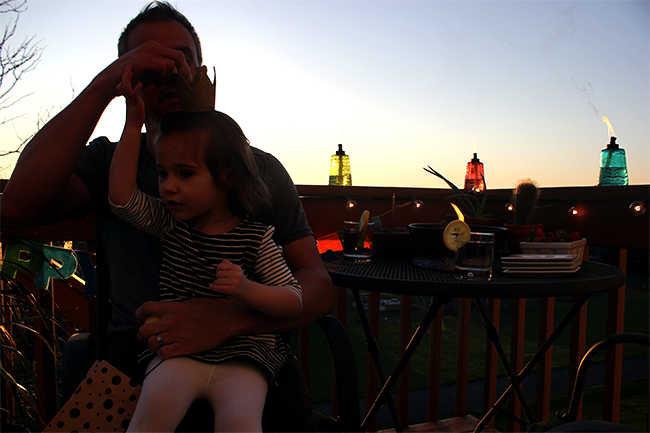 And best of all, the evening inspired us to make it a regular occurrence this summer to power down and hang out on our deck together as a family. I highly recommend doing the same with your loved ones. By doing something as simple as turning off your electronic devices and creating a simple outdoor space with a nice warm ambience, you’d be amazed at how profoundly different an experience you can have with the people you care about. And speaking of connecting with friends and family, TIKI Brand has created a event called The Night of the Power Down that will take place on June 26. I will be participating and I hope you guys will be as well! You can find more info here: Tikibrand.com/Power-Down. Here’s to a summer full of real life experiences with your favorite people!